I was taking to the Skirball Center. gotten around to taking her. confidence she is with me. My mother Suzanne Lawrence passed away July 30; here’s more about her and more 3:15 poems about her too. I posted one last week about my mom departing for Burning Man; I see her hanging out at the Temple. Back in June, we decided NOT to go to Burning Man this year, for a number of reasons including finances, work demands, and this one. Now I really want to go, just to spend time in this beautiful Temple to grieve for my mom and poet Paul Squires who died just before my mom did. It’s been quite a challenging year for me and I could use time on the playa like never before…and I’ve gone a dozen times sine 1992. 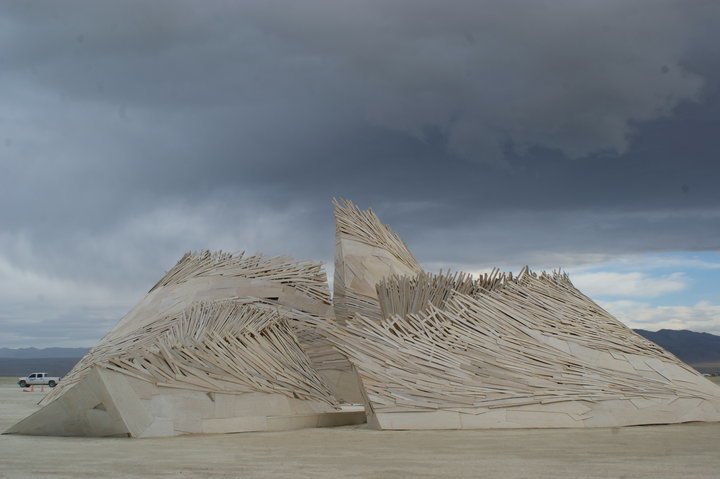 Thanks to fellow Burning Mom Jennifer Baum for letting me share the 2010 Temple at Burning Man photos. I will be adding more of “Absinthia’s” 2010 Burning Man photos in a new post up soon. For more poetry by other people, catch a ride on the Monday Poetry Train. By the way, tonight is the last night of the 2010 3:15 Experiment! One night to go! ← Burning Man 2010: So you can’t go this year? Here’s what you can do! I’m so glad this image resonated so strongly with you. While at Burning Man this year, I had a birthday that officially made me older than one of my closest friends ever made it. He died shortly before his 40th birthday. Another close friend committed suicide last Thanksgiving. Although I left the playa before the event officially began, the Temple crew graciously let me cross the caution tape and write a memorial note on the Temple. It was the most difficult thing I have done in a long time, and I am so glad I was able to do so. The Temple holds so much meaning to so many. I am eternally grateful to David Best and the crew that build the Temple each year. My condolences to you and all who have suffered the loss of a loved one. Thank you, Abs, for sharing your photos and for coming by and commenting. I am so sorry about your friends. Thank you for telling us about them. How generous (and Burneresque) to allow you to put something there. I’ve been asking people to go there for me but I didn’t send anything. I would like some of my mom’s ashes to be there but that seems difficult too. Honestly, last year’s Temple reminded me of a Disco Ball–all those stairs and fire and energy was too much like a party and didn’t feel very sacred. I’d come to mourn the passing of my nephew’s father and we’d plan to go to the Temple burn together as we had in 2007, but we left before the Temple burn. This Temple is worthy of our prayers and meditations and seeing your photos makes me want to go out there so much….but it also give me something to imagine…as you know, this has been a very difficult year for me. Thank you again Abs for letting me use this photo; I plan to post others tomorrow. Love the paper bag imagery – i read that as symbolic of the fragility of life – such a domestic and plain wrapper for the sacred. I’m glad you could find some healing through the experiment this year. Thanks for posting that photo. It is awesome. And hugs for you..